“Maybe I’m a feminist,” teenage protagonist Jamie (Lucas Jade Zumann) tells his mother Dorothea (Annette Bening) partway through 20th Century Women, and there is perhaps no better statement to sum up what makes this film so special. This is the story of a boy essentially being raised by the woman in his life, without a clear male role model, and the twist is that he’s turning out just fine. The film takes place in Southern California in the 1970s, a time when the sexual revolution and female empowerment were in the public spotlight. Dorothea is very much in the thick of these changing cultural attitudes, and Jamie is a sensitive kid very much in tune with other people. So following the old adage that it takes a village to raise a child, she enlists the help of those around her to help her son find his place in the world. There’s Abbie (Greta Gerwig), a young photographer who is renting a room in their house and struggling with possibly having cervical cancer, his best friend Julie (Elle Fanning), who wants to keep it platonic, but Jamie harbours sexual feelings for her spurred by the fact that she often sleeps over. The closest thing Jamie has to a man in his life is William (Billy Crudup), who is also renting a room and doing renovations around the house, but he is perfectly fine with letting the women take the lead. Director Mike Mills loosely based this story on his own mother, which is fitting considering that his previous film Beginners was inspired by his father. Because of this, he holds clear affection for these characters, and draws wonderful performances out of his cast. Annette Bening delivers nuanced and quietly emotional work as a mother trying to do the best she can for her son, while at the same time reconciling herself to where she is in her own life. Greta Gerwig shines in one of her best roles, and Elle Fanning does some of her most mature work yet, really coming into her own as an actor. Billy Crudup is also excellent, and Lucas Jade Zumann impresses in one of his first leading roles. This is a true ensemble, and the film works because the characters all feel completely fleshed out and developed on their own terms. Jamie could certainly be seen as the through line, but the other characters aren’t only shown through his viewpoint. They all have their own hopes, dreams and fears, and their own personal back stories that are individually revealed through some beautifully done moments of voiceover. They all exist to support each other and help each other grow throughout the film, and it’s a delight to hang out with them for two hours. This is one of those films that I just really enjoyed spending time with. It’s filled with a multitude of warm and funny little moments, like a delightfully awkward dinner table conversation, and it ends on a moving and bittersweet note. 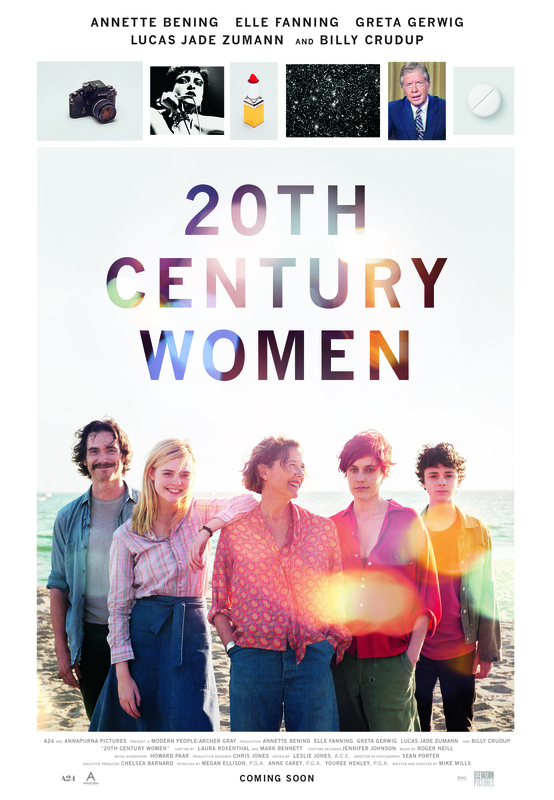 Anchored by the lived in performances of its outstanding ensemble cast, 20th Century Women is a poignant and incredibly entertaining portrait of America in the 1970s, and an entirely wonderful story of a boy coming of age surrounded by strong women. 20th Century Women is now playing in limited release at Varsity Cinemas in Toronto, and will be expanding to other cities across Canada next week.